MARY ALICE WILLIAMS: Both were forms of medieval meditation, but with opposite intents. A maze, with its blind alleys and dead ends, is meant to confound. A labyrinth offers one direction, one path that leads you to the center. That ancient construct has some very modern advocates, and they’re not just religious. Ruben Martinez reports from San Francisco. RUBEN MARTINEZ: Walking a series of concentric circles may seem like a curious ritual, but for some, it can be a profound spiritual experience. Reverend LAUREN ARTRESS (Grace Cathedral): It becomes a matter of trusting the path and surrendering to it; walking the pattern that symbolically takes you to center also experientially takes you to your center. MARTINEZ: It was 10 years ago that the Reverend Lauren Artress discovered the labyrinth as a form of walking meditation, a spiritual practice that quiets the mind and awakens the imagination. As canon pastor at San Francisco’s Grace Cathedral and also a practicing psychotherapist, Artress had been searching for tools that would satisfy what she sees as the great spiritual quest of millennial America. Rev. ARTRESS: We think our way of — to the mystery or to God or the divine one is through thinking, and that’s not true. It’s through experiencing. And the labyrinth is a perfect container for ourselves. When you walk into the labyrinth, it really becomes a reflection or a mirror of the soul. You can see that part of yourself that really works against yourself. You can see your critical inner voice against yourself and against others. Anything that stops you from connecting to the divine, it has to come to the surface and release, and that’s what happens in the labyrinth. MARTINEZ: Before bringing a labyrinth to her own church, Artress had journeyed to Chartres Cathedral in France, where medieval builders had hewn this pre-Christian symbol into the stone wall. Rev. ARTRESS: It had not been uncovered for several hundred years, and it was quite amazing when you see it. MARTINEZ: Artress walked the Chartres labyrinth as she believes the medieval pilgrims had done, perhaps as a substitute for a journey to the Holy Land. As a result of her efforts, the Chartres labyrinth has now been opened for modern-day pilgrims to walk the ancient path. 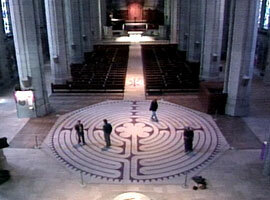 Five years ago, at the urging of Lauren Artress, San Francisco’s Grace Cathedral began a trend by installing a labyrinth modeled precisely after the one in Chartres. There’s now a network of churches across the country using labyrinths, encouraged and supported by the worldwide project Artress heads. Rev. ARTRESS: How many of you are able to have a labyrinth in your life? MARTINEZ: Artress teaches the labyrinth as a ritual without formulas or dogma. 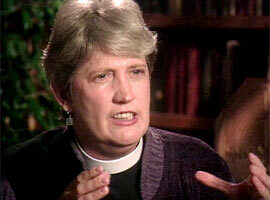 She calls it a process that crosses denominations and faiths. Rev. ARTRESS: This is part of what’s being redefined again for us, as we begin to search and realize that we are spiritually hungry and that most of our traditions that we have aren’t addressing that hunger. MARTINEZ: Secular institutions have also discovered labyrinths as a meditation tool. The California Pacific Medical Center in San Francisco was the first hospital to install a labyrinth to support staff and patients. Ms. NANCY HOPSON: Soon after my diagnosis with breast cancer, I was just agonizing over a decision. I walked the labyrinth, and by the time I got to the middle, I realized that it was all going to be okay one way or another, and there might be something to learn — be learned from this experience. MARTINEZ: The labyrinth experience is as varied as the individuals who walk its paths. It is a place where people can mix Christian mysticism with psychology or Buddhism with self-help. And how would you respond to a skeptic who would say that you are basically going out of bounds, outside the religious institution? Rev. 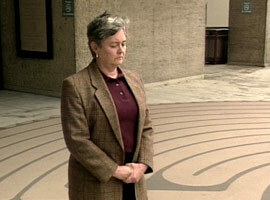 ARTRESS: It’s never outside the tradition, because the labyrinth is a path of prayer. And the more ways we can help people pray and meditate and quiet the mind, the better off everybody is. MARTINEZ: The labyrinth may go the way of temporary spiritual fads, but right now it’s a clear sign that Americans are still looking for answers and new rituals and practices. Rev. 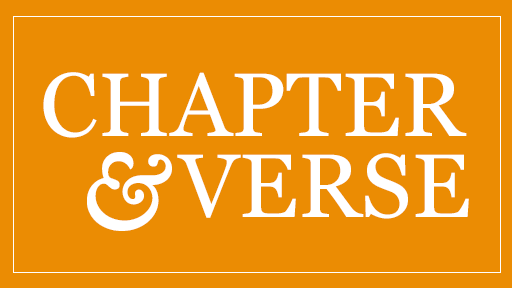 ARTRESS: We’re in such a — profoundly, deeply changing times that we don’t know what end is up. So find something to focus you; find something that embodies you; find a path that keeps you prayerful, thoughtful, open, and moving with the flow. And I think that’s what the labyrinth does. MARTINEZ: For Religion & Ethics NewsWeekly, I’m Ruben Martinez in San Francisco.